Q: How long have you owned the shop? A: I have been in business since 1976. I opened and operated in Lexington, Ky from 1976 to 2001. I moved the shop to South Carolina in 2004. I had to move here for family reasons. Q: How did the store get its unique name? What does the "Two" represent? A: I named the store Two's Company because the number two had many associations for me. I have a twin, I had 2 brothers, I had 2 daughters, and at the time I had 2 cats and 2 dogs. Q: What is your shop specialty? A: Our specialty is and always has been custom canvases. I had my wholesale line for almost as long as the shop - JHL and Company - now being distributed through Julia's Needleworks. We are strictly a needlepoint shop. Q: Tell us about your staff. Who would we meet at the store? A: The most loyal employee is Doodles - the 16-year-old cat. She takes her job as greeter very very seriously. She is worn out by closing time. Four others work here part-time: Linda (she taught chemistry for years at Tulane), Karen (native from here - a very rare species), Randi (new to the area from Texas), and my step-granddaughter Tasha. Q: Which Kreinik threads do you carry? A: We carry all sizes of Kreinik Braid, blending filament, Japan thread, 1/16th and1/18th ribbon. The displays take up 2 walls. Q: Do you sell online, or by mail order too? A: People buy through our store, by phone for mail-order and on-line. Q: Do you have classes? A: We not only teach here, we have every year an ongoing mail-order class - all my own original designs. Last year we did nutcrackers - this year is a Nativity set. Every month, my customers get a package containing the canvas for that month, all the threads needed, and a stitch guide with a picture. Q: Has anyone famous ever visited your store? A: I have had several famous people that I meet after hours. They prefer to keep it our secret - I will comply. Q: Here at Kreinik, we love good food. Are there good restaurants near the shop? A: There are 5 restaurants on East Main within 3 blocks. They range from Thai food to New Orleans cuisine, a Greek restaurant, an Irish pub, and Kinch's (down-home country food). Q: What is the best part about being involved in the needlework market? A: My favorite part of being in this business - what keeps me in this business after so many years - MY CUSTOMERS. I love them. Check out the Two's Company web site for more information on this fabulous shop. Click on "About" and you will see that they can design a custom needlepoint canvas for you. Another notice on that page caught our eye: "We will be happy to ship to you any order of fibres - no matter how small the order. If you have a canvas and need fiber and stitch suggestions, send it to us and we will kit and return it to you." That's great service! Check out at www.twoscompanyneedlepoint.com. Kreinik has worked with professional designers all over the world for 40+ years. We are always amazed at how they use Kreinik threads in their design work. Their creativity inspires you as consumers, provides retailers with business, and inspires us to come up with new colors and products. In continued support of designers, we want to spread the word about an opportunity for counted thread and embroidery designers to bring their innovative ideas to a TNNA trade show. Read on for details. As a needlework designer, have you debated about bringing your counted thread or embroidery designs to a trade show? You know how important it is to be visible, but aren't sure how to get started. Well, the Counted Thread & Embroidery Group (CTE) of The National Needlearts Association (TNNA) is giving you a chance to WIN a trip to the Winter 2012 Needlearts Trade Show. TNNA's CTE group will be awarding scholarships to five new counted thread/embroidery designers to exhibit at the January 2012 Phoenix trade show. This New Designer Program is a way to help new counted thread and embroidery designers with creative ideas and irresistible excitement reach national and international retailers. Scholarship includes exhibit space, plus electricity, carpet, material handling, basic booth furniture (if needed). Designers winning the scholarship will share this exhibit space. This scholarship does not include transportation or lodging. However, a stipend to help defray expenses will be provided to each recipient. Winners will be determined by a juried process: a committee of TNNA/CTE members will be looking for quality design, presentation, and originality. Don't delay; your portfolio is due by November 1, 2011. You have the ideas and talent, now let's get you to a major industry trade show. For a complete list of rules and application process, email CTE.TNNA@gmail.com. The headlines are up already: "Holiday shoppers plan to spend less this year." 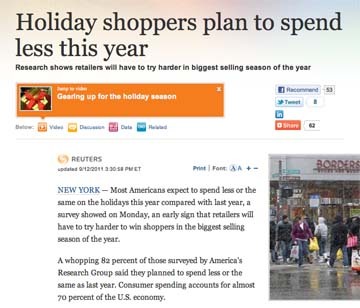 (msnbc.com, 9/12/11) Some say online sales will boom, others are too uncertain to predict. Nevertheless, consumer spending is a hot topic right now. When the holidays roll around, it is tempting to overspend on gifts for family and friends. We want to show people how much we love them, and often think that gift after gift will make them happiest. However, the realities are: 1. many people simply don't have money to overspend, 2. our loved ones would rather have us than things. The holidays are really about making connections — spending time together (face to face or Skyping), making memories, and celebrating traditions. We still want to give presents, but we can be more thoughtful about them. One way to spend less and give more this holiday is with handmade gifts. Crafted ornaments, cards, and presents are as much a part of holiday traditions as, well, Santa Claus himself. Now more than ever they can show how much you love and care without breaking your bank account. Here at Kreinik we have created new projects for you to make meaningful yet inexpensive gifts this holiday season. Check in with www.kreinik.com each week as we debut the new kits and products. If you have a local needlework store, look for (ask for) the new items. If you prefer online shopping, www.kreinikmall.com will have everything. In this case, the name does not say it all. In fact, you may not know that Sign of the Arrow in St. Louis, Missouri, is a needlework store. Check out the main photo on their web site, however, and there is no doubt (visit www.signofthearrow.com). We just had to ask the shop how they got their name. Read on to discover the people and mission behind this fabulous store that not only donates all shop proceeds to charity, but also has "belted" some people you've seen on TV. Q: What is the story behind your store's name? A: Established in 1966 by the St. Louis Alumnae Club of Pi Beta Phi, Sign of the Arrow is a philanthropic retail needlepoint and gift shop that donates ALL shop proceeds to area charitable organizations. “Sign of the Arrow” refers to the fraternity’s symbol, the arrow. Since its inception, Sign of the Arrow has donated more than $3.3 million to 150+ local charities. Shoppers truly impact the lives of St. Louisans by shopping at Sign of the Arrow. Q: Wow, the shop has been around a long time! 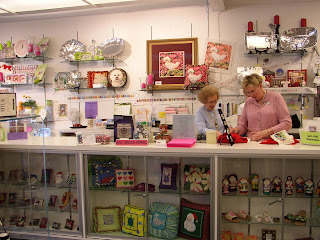 A: Sign of the Arrow, is a premier destination for needlepoint shoppers. We are widely known for an extensive selection of designer needlepoint, including hand-painted canvases, custom designs, custom finishing, furniture, fibers, trunk shows, and classes for all ages. 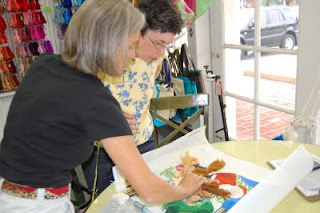 Knowledgeable staff and volunteers assist both novice and experienced needlepointers. 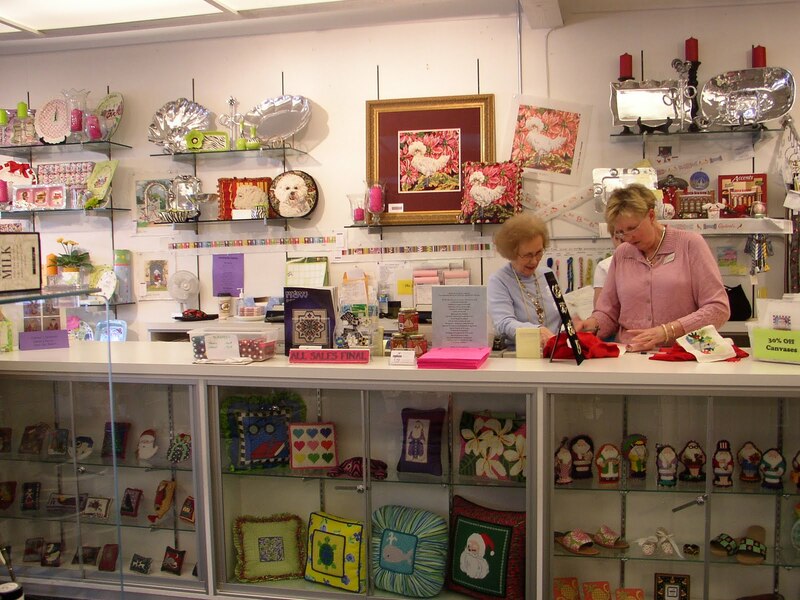 In addition, Sign of the Arrow offers unique gifts, including decorative accessories, holiday decorations, sorority gifts, baby gifts, picture frames, stationary, and more. Q: Tell us about some of your staff. Who would we meet when we visit the shop? A: Julie Filean, General Manager; Randi Hanpeter, Assistant Manager – Needlepoint; and Beth Hendzlik, Needlepoint Specialist, make up Sign of the Arrow’s management team. In addition to the management team, the shop is staffed by 90+ community volunteers who give 18,000+ hours annually to help run Sign of the Arrow. A: Sign of the Arrow carries Wired Braid™, Japan Thread Colors, and Metallic Threads. Q: Can people buy from your store online or through mail order? A: Shoppers can visit www.signofthearrow.com to shop online, or contact the shop directly to place an order. Sign of the Arrow provides an extensive and thorough mail order business to individuals and needlepoint shops country-wide. Services include finishing, stitching, choosing fibers and fabric for canvases, monogramming, blocking, and custom painting. 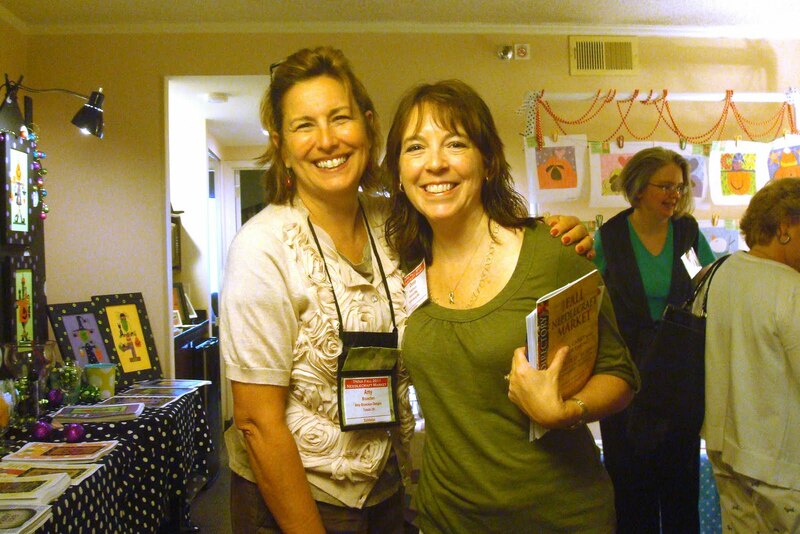 Q: Do you have in-store classes, special events, online classes, or offer one-on-one teaching? A: We have a variety of classes for stitchers of all ages and abilities, including specialty stitching classes, such as turkey work and other decorative stitches, as well as children’s classes, specialty fiber classes, and one-on-one classes. Classes are offered in person at Sign of the Arrow. In addition, expert stitchers are available to help with a specific question. A: As the “needlepoint belt capital of the world,” Sign of the Arrow’s custom artists paint a variety of belts for customers all of the country, including a variety of sports-themed belts. As a result, a number of St. Louis Cardinals trainers frequent the shop and sport a variety of these custom-painted Cardinals belts at every game. In addition, a variety of St. Louis news media have frequented the shop and wear their belts and other needlepoint items on set. Sign of the Arrow has also designed a number of pieces for important people, including the Prie Dieu (prayer kneeler) for the Pope’s visit to St. Louis; a variety of custom needlepoint items for celebrities, including Beverly Sills, Barry Manilow, and a prominent Hollywood producer; and some items for politicos, including eight belts for Karl Rove; many items for the Bush family; and for Ohio’s Governor Harry Ott. Q: Here at Kreinik we love to talk about food. What's the name of a good place to eat near your store? A: Directly across Clayton Road is locally-owned and award-winning Red L pizza, with the famous meatloaf pizza; and Companion Bakery for breakfast or lunch. Lester’s is also right down the street. Q: What is your favorite part about being in this business? A: Sign of the Arrow is a fun, relaxing, and creative place to work at and visit. At the same time, all proceeds benefit deserving charitable organizations, with more than $3.3 million donated to 150+ agencies. Sign of the Arrow truly impacts the lives of St. Louisans by providing high quality specialty needlepoint and supplies, as well as gifts. Who could ask for more?